In this post of my blog I will display scans of covers of chess and non-chess magazines with women chess players featured. Let me start with the cover of the Sports Illustrated Magazine of August 07, 1961 with an American chess player Lisa Lane. 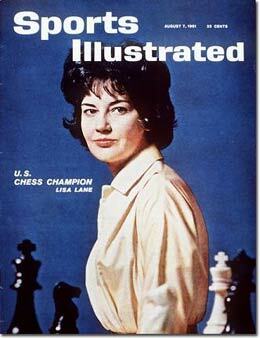 It's probably the most famous time when a woman chess player was featured on a non-chess magazine. Chess is a very popular game worldwide, millions of people play chess, nevertheless the media doesn't speak often about chess and chess players. All the chess fans know that "Chess is Cool", but in order to make chess more popular in the world we have to try to show people who don't play chess why our beloved game is so interesting. If you are a chess player and have been featured on a chess or especially non-chess magazine cover (or you have seen such a cover), I will be very glad if you will send me a nice scan of that or those covers, I will post the nicest ones so that everyone sees that women chess players do make it to the cover!